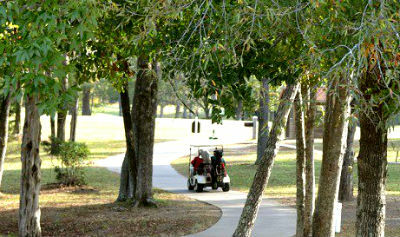 The Oaks Golf Course is challenging and the area offers many attractions. Photo courtesy Alabama Department of Conservation and Natural Resources. State parks generally offer quality golf courses, many with surrounding activities. Oak Mountain State Park in Pelham, Alabama is just that. The Oaks Golf Course opened in 1974, and was designed by Ed Stone. A few years ago, it was reworked by Alabama native and PGA Tour professional Jerry Pate. Named after a Civil War leader, the town of Pelham is a Birmingham suburb with about 20,000 residents. This 18-hole, par 72 course measures 6,842 yards from the tips (blue tees). Challenging water hazards are on nine of its 18 fairways. Additionally, one-third of the holes feature a dogleg left and seven holes correspondingly offer a dogleg right. The fully-stocked pro shop rents golf clubs and is a Wi-Fi hot spot. Despite a recent drought throughout most of Alabama, Oak Mountain State Park officials report that the course is in good shape (especially the greens). The golf complex also offers a driving range, chipping green, and practice green, which is open all year. Oak Mountain State Park is Alabama’s largest state park with a plethora of activities. Those traveling with pets will be happy to know that dogs and fury felines are welcome, and there`s plenty of space. In fact, the RV park has 155 sites and many are pull-throughs. The state park campground also has all of the amenities you expect are available including 30/50-amp power, sewer, restrooms, showers, a playground, and plenty of walking trails. A popular activity is the Alabama Wildlife Center in Oak Mountain State Park This is Alabama’s oldest and largest wildlife rehabilitation facility and annually receives about 1,800 birds from more than 100 different species. This nonprofit organization has a twofold mission. It provides medical and rehab care for injured and orphaned birds. The organization also educates the public to heighten awareness and appreciation for wildlife. Peavine Falls is another popular hike for many visitors. The 65-foot, spring- fed waterfall requires a steep climb getting to and from the waterfall. If you plan to cool off here, park officials warn that the water is extremely cold! What’s more are several popular activities to include equestrian trails, BMX trails, fishing, boat rentals, and geocaching, to name just a few. If you’re exploring Pelham, make sure and stop at the popular Highland Gourmet Scones. A few favorites include hazelnut crème chocolate chip, orange cranberry, café mocha, and pumpkin spice. We live close to this park. We drive through it regularly and always find it clean and with excellent facilities. We would not hesitate to recommend it based on non camping observations. A good friend work camped there for several years and has positive experiences.